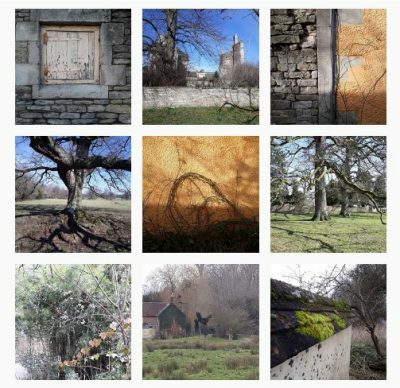 Instagram, one year on... creative outlet or vortex of pointlessness? 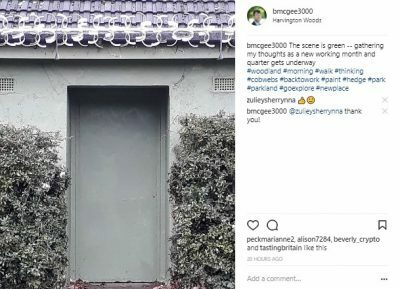 Instagram as a vortex of online pointlessness, the sceptic may say… An outlet for creativity and the chance to make fruitful connections, in business and beyond, runs a counter-argument. It’s about a year since I first posted a photo on Instagram. Since then not a day missed – an achievement of sorts – and for several months I’ve posted three images every day, thematic whenever possible. Like other business owners, I too am finding my way on the social media platform that features the über-followed singer Selena Gomez (more than 130 million devotees), Real Madrid footballer Cristiano Ronaldo and pop star Ariana Grande. As I take Instagram stock a year on, here are a few ideas that may help you plan your next steps on a platform that now numbers 25 million businesses. Slowing down when time allows — or choosing to slow down. There’s a question that goes way beyond Instagram. Taking a few moments here and there to notice details and enjoy the simple pleasures, local treasures (wherever you happen to be). That gets my vote, for one. Material for Instagram too? Yes indeed. I noticed the “pond life” photo, for instance, on my way back to the station from a networking event at Lingfield races run by London Chamber of Commerce. As time allowed, I decided to stay on and take the next train so that I could go for a walk in a new place. Instagram photos for that day’s edit? For sure. A year later as a daily Instagram user is no bad time to keep my eye out for workshops and events that will help things Instagram progress. I run workshops myself for business owners who want to get more out of social media, so perhaps no surprise that I too keep an eye-out for opportunities to deepen my own skills. As for Instagram, there seems to be no shortage of training sessions, from Advanced Instagram Strategies for Business on Tues 1 May in Tunbridge Wells to “Upping Your Instagram Game” in London on Mon 14 May. Wherever possible I include captions before adding hashtags on Instagram. Lately I’ve started adding more of a narrative to some of my posts. I plan to do more of that. You’re on Instagram, posting images regularly. Great. The link to your Instagram is on your website? Even better. When out and about, networking or when chatting to your existing clients, remember to mention Instagram too. You may also want to send a tweet now and again with a recent screenshot of your Instagram activity. 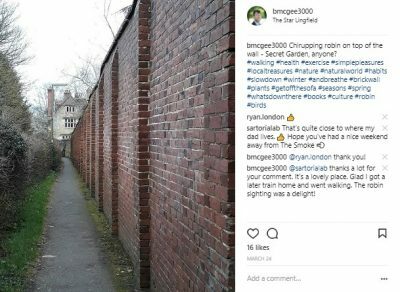 When trying out a new feature on Instagram, for instance following hashtags that are of interest to you, perhaps you can ask in a quick post on LinkedIn what others’ experience of this is. 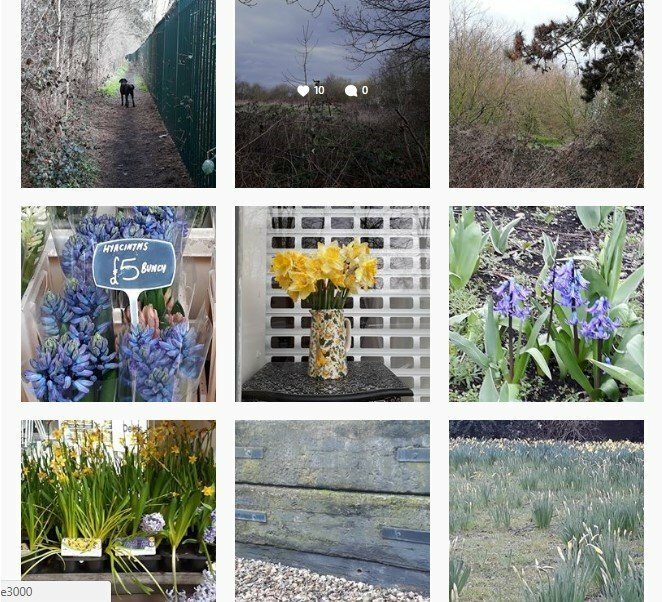 In the past couple of months I’ve started to send the occasional set of postcards from the London suburb of Penge to say thank you for people’s regular engagement with my Instagram photos. 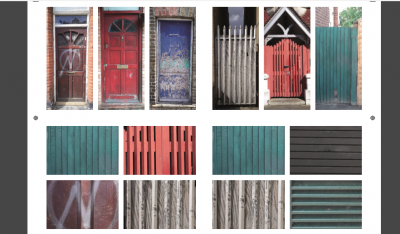 If they’re kind enough to reply, or perhaps when I’m in touch with them later, I may even send on a link to my blog about the #PortesdePenge community postcard project I have on the simmer. You may have a hashtag or two of your own creation on Twitter, for instance. Why not mention them in your email signature or in LinkedIn messages? What about the time this all takes? That’s a fair question. Sure, you want more people and businesses to see the content that you post on Instagram. Never mind the width, feel the quality — in other words, what engagement are you getting? Likes are great, of course, comments even better. After all, someone has taken the time and trouble. As on other platforms, if someone adds a comment on Instagram, like what they’ve written and add a quick reply if possible. That may well encourage them to comment again on other images — if that is what you want. Missed a comment posted a while ago? That happens, as in this photo taken during my walk in Lingfield. When out and about over the Easter weekend, I had some time to take some photos for Instagram. This caught my eye and also supplied “matching” (flowers above, jug below) as that day’s #briandword on Twitter. It was Easter Sunday so I decided to give promotion of my Easter blog, published a few days earlier, a rest. Maybe you’re having a change of scene for few days. Taking the sea air, going for long walks along the coast, planning what comes next. Grand! (On another trip to Folkestone a few months later, I posted the same image — but this time without the cars, so a much “cleaner” photo. Months ago now, I had a few minutes to spare before meeting up to do some work with graphic designer Stephen Shillito. 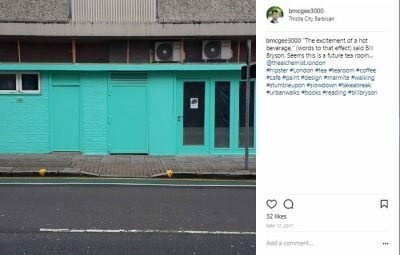 The design and colours of a new shopfront caught my eye. Little did I know that this would get a fair number of likes. I’m willing to give that a go. Using the same hashtags over and again can affect how many people get to view your Instagram post, according to a Feb 2018 blog on Later, a marketing platform. While writing this, I used some alternatives to the hashtags I would usually add to an image like this one, taken during a morning walk. 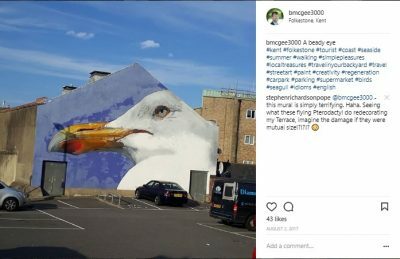 As ever with any there will be an element of trial and error as I figure out which hashtags help to get more eyes on my Instagram posts and then, better still, onto my website. Whatever stage you’re at in your business, chances are there’s an example in your industry or elsewhere that gives you ideas, heart, encouragement… The same applies to Instagram. Someone may have a completely different business to yours, but what they post is grist to your ideas mill. Perhaps you’ve got some coverage in a local newspaper or trade magazine? 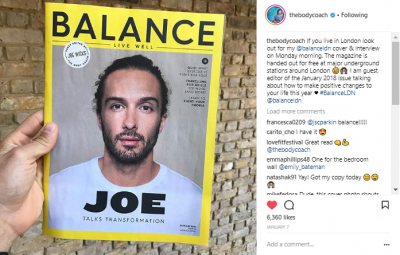 Why not follow the example of personal trainer Joe Wicks and take a photo of it for Instagram? My ambitions for Instagram so far have been to keep myself front of mind for writing, editing and copywriting, also to promote the social media workshops (including the #BOWRivoli series at Rivoli Meeting Room) I run for business owners. As with any activity on social media, it’s important to be clear about what we want to achieve from it. What comes next for me on Instagram? I’m giving that some careful thought. Here’s hoping that the next year on Instagram means more creative inspiration, well clear of any vortex of pointlessness. 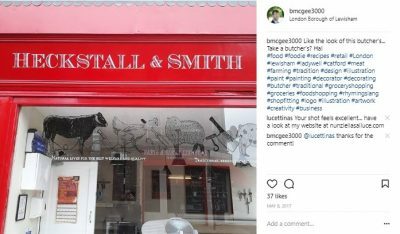 *What’s your own experience of using Instagram for business? Sign up for occasional updates, with your consent. Unsubscribe? You can at any time. Great read as always Brian – lovely on the eye and easy on the brain, packed with useful information and food for thought. Thank you! Many thanks Jackie, what a lovely comment. Encourages me to keep on blogging. Next one on Weds 11 April! Brilliant post Brian. Thank you. Many thanks for your comment, glad you enjoyed this blog. Good to see you at the #LinkedInLocal event in Croydon the other day. Great post Brian! Instagram works when you give without expecting to receive, and it does pay off eventually! Thanks a lot for your comment, Yolande. Instagram is an interesting platform, for sure. I’ll look out for your posts! Great post, Brian. Thank you. Thanks a lot for your comment, Allison. Glad to know that you found the blog useful.